Although humans and animals are different in many ways, some advances in human medicine are also very useful for veterinary patients. 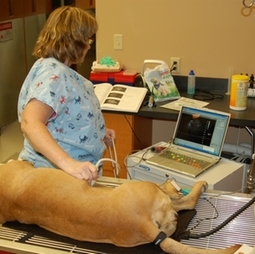 One of these advances, diagnostic ultrasound, has proven to be a powerful tool in veterinary medicine. As a practice, one of our goals is to offer state-of-the-art medicine and diagnostic testing; so we are pleased to offer ultrasound services as a means of providing a higher level of quality care to our patients. We also have a portable ultrasound for our bovine and equine patients. Ultrasonography is a type of diagnostic technique that uses ultrasound waves to produce an imaging study. This means that when we perform ultrasonography, we can see internal images of the patient's body. Unlike some other imaging studies, like x-rays, ultrasonography does not use radiation. Instead, ultrasonography uses high-frequency sound (ultrasound) waves to create a picture of what is inside your pet's body. Ultrasonography is a completely non-invasive, painless way to diagnose and evaluate many common diseases. Click Here to see our Ultrasound in action.